Now…more than ever. A statement that rang so deeply within my core, a 22-year-old, representing an intentional community that is seven years older than myself, in a consensus meeting of over 200 people, for a gathering in its 48th year. The Holistic Sustainability Semester focuses on the five spheres of sustainability: Ecological, Social, Economic, Worldview, and Personal. The course couldn’t have come at a more important time in my life (Fall 2016) as I was seeking a deeper connection with the Earth and longing for a sense of tribe in my day to day life. Through group ZEGG Forums, talking stick ceremonies, and communal ecstatic dance I was opened up emotionally like I never had been before. At times it was both necessary and challenging to work with elements of the shadow self. With classes ranging from permaculture design to history of intentional communities, indigenous wisdom, nonviolent communication (NVC), sustainable economics—and with renowned communitarians such as Ma’ikwe Ludwig and Laird Schaub traveling across the country to teach in the course—the three-month immersion provided a framework to quickly dive into a lifestyle committed towards networking communities. Lost Valley is a 501(c)3 learning center, educating youth and adults in the practical application of sustainable living skills since 1989. 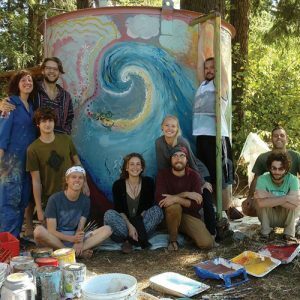 Located on 87 acres, a 30 minute drive southeast of Eugene, Oregon, Lost Valley also operates as an aspiring ecovillage, housing 40-plus resident-educators, using a governance system adapted from Sociocracy, with consent-based decision making. Within months of becoming a resident I found myself in roles such as the Secretary of the Board of Directors, managing a humanure composting system, marketing educational programs, and representing Lost Valley at the Intentional Communities Booth of the Oregon Country Fair’s Community Village. 2017 was my first year participating in the Oregon Country Fair, located just west of Eugene in Veneta, Oregon. The Fair has extremely deep roots, dating back to 1969, and is a community in its own right. I found the Fair to be a wild, dance-filled cultural experience with synchronistic connections constantly flowing. The Oregon Country Fair truly feels like a family—especially for those who participate in a role with the Fair, which is open to visitors from 11 am-7 pm for three days but continues throughout the night for those who play a contributing role or have become an elder of the Fair through consistent years of contribution. The OCF features concerts, circus acts, Alice in Wonderland-like costumed performers, presentations on solar energy, activist centers, booths of all sorts of craft creations, delicious food, and much more. It is a one-of-a-kind experience! The Community Village, an activist center, often referred to as the heart of the Oregon Country Fair, defines itself as “a part of the Oregon Country Fair Family that is dedicated to education, information access, and networking for progressive social change. We create a spiritual center manifesting the Village Vision of love, peace, trust, justice, cooperation, equality, and social service. By believing in dreams, thinking of others, valuing differences, and experimenting with new ideas, we hope to expand our consciousness, growing beyond the Fair into the world at large.” The Community Village meets at least once a month year-round and operates on consensus. The booth represented not only residential intentional communities in the Eugene, Oregon area, including Breitenbush Hot Springs and Retreat Center, East Blair Housing Cooperative, Heart-Culture Community Farm, Lost Valley Education and Event Center/Meadowsong Ecovillage, and Maitreya Ecovillage, but also groups dedicated towards community-building: the Eugene Avant Gardeners, Heart of Now, and Network For a New Culture. During the meetings before the Fair, through connecting with representatives for Network For a New Culture, I became aware of La’akea Permaculture Community in Pahoa, Hawaii. La’akea’s mission for egalitarianism, consensus decision making, off-grid living, and permaculture deeply aligned within my own core values. I began to ask myself the question: How can I best connect intentional communities? What came forth was to spend the winter at La’akea—building a bridge between two different communities—and to return to Lost Valley in the spring to share what I have learned. La’akea Permaculture Community was founded in 2005 by a group of individuals who connected at a Network For a New Culture Summer Camp in Oregon. Located on 24 acres in the lush rain forest of Puna, Big Island, La’akea is fully off-grid, using solar power and rainwater collection systems. La’akea operates as an event center hosting the Network For a New Culture Winter Camp and Summer Solstice Camp, as well as ISTA (International School for Temple Arts) trainings—a worldwide network for spiritual, sexual, shamanic healing. The community has 10 adult members plus two children, and is actively seeking new members. There is also a work-trade residential exchange to live in the community as a non-member. La’akea has held space for deep exploration of the heart and soul in ways that give me clarity on why I choose to live in community. Through weekly heart-shares, a strong focus on communication, authentic relationships, and encouragement towards polyamory/sexual freedom I have found that I have stepped into my power, in balance of masculine/feminine more than ever before. I will always remember the times of planting over 100 Taro plants, a sacred food source to native Hawaiians, and all the work that went into the main house construction project. However, what I expect to remember most is my first Network For a New Culture Camp. Network For a New Culture, inspired by the ZEGG community in Germany, seeks to build a sustainable, violence-free culture through exploring intimacy, personal growth, transparency, radical honesty, equality, compassion, sexual freedom, and the power of community. New Culture camps are hosted across the United States at different times during the year. New Culture Winter Camp was the most powerful community-building container that I have been a part of to date. I did find that I was quite young in comparison to the New Culture attendees, with an average age range of late 40s to mid 50s. However, I believe that New Culture is very accepting of the younger generation, and encourages younger energy to come into the tribe. Through daily ZEGG Forums, communal meals, workshops on tantra, dance, NVC, and various forms of social permaculture, the container got stronger and stronger each day. Having gone through a multitude of personal breakthroughs—deep laughter, crying, safe screaming, dancing, sensual play, tantric temples—I had never opened up so fully before. Through my experience I believe that Network For a New Culture is one of the most capable containers for living intentional communities to be created out of, just as La’akea was in 2005. As my half-year stay at La’akea was wrapping up there began to be changes in the movement of the Earth. My last day at La’akea was May 3, 2018. During the last four days earthquakes shook the community, upwards of 150 a day, with the magnitude increasing to 6.9. I recall, four hours before my departure while lying on the floor of the tiny home I resided in, the Earth feeling as if it was continuously moving underneath me. While waiting at the airport I received a message stating that fissures of lava were opening up in Leilani Estates, a residential neighborhood approximately three miles from La’akea. I felt an immense desire to be with my community family at La’akea during this time, but recognized I needed to continue on with my flight back to Lost Valley. In my initial shares with the Lost Valley community, regarding my experiences and desires to build deeper bridges between Lost Valley and La’akea, it was hard to resist tears in expressing the unknown that surrounds a community that I love dearly. There had already been talks on working together for co-creating a Permaculture educational course/internship that could involve a Permaculture Design Course at Lost Valley and a hands-on internship at La’akea. However, this has been put on hold with the eruption. Much of the community has taken this time to travel to the mainland to work on projects or visit family. About half of the members are still on the land as of July 1. Although the flow has continued to move south towards/into the ocean away from La’akea, the quality of the air has the community considering a more permanent evacuation, at least until the eruption ends (which is unpredictable at this point). This eruption has deepened my connection with the members of La’akea. As of July 1, I have had the opportunity to host five different residents/members from my stay at La’akea, and provide Lost Valley as a place of rest while away from the island. Some of them have stayed for multiple weeks. Although in ways originally unexpected, there has truly been a bridge built between Lost Valley and La’akea. The 2018 Oregon Country Fair Intentional Communities Booth is in full swing, with additions of Dharmalaya, an urban permaculture center in Eugene as well as The Mothership, an urban community in Portland. In my return to Lost Valley I have most recently begun playing the role of Visitor Coordinator. Through this role I have desires to connect with other communities on how we can better support each other through visitor exchange programs and sharing knowledge to visitors about other intentional communities that may meet their needs/curiosities best. However, what I have come to learn through my stay at La’akea is that the most impactful way to establish a network of communities is through authentic relationships. I continue to find myself in awe of the communal networking that I have been blessed to be a part of since the flyer at the university of Georgia caught my eye two years ago. Living in community has facilitated an opening of the heart, deepened communication skills, created a rooted connection with the Earth, and ignited a passion for life. I believe I have a duty to network with others who are doing this work. It’s time to Connect: Now More Than Ever. Setesh FreeMan is a member of Lost Valley Education and Event Center/Meadowsong Ecovillage, Permaculturalist, Ecstatic Dance DJ, avid tree climber, Deadhead, and dedicated to the Network For a New Culture movement.